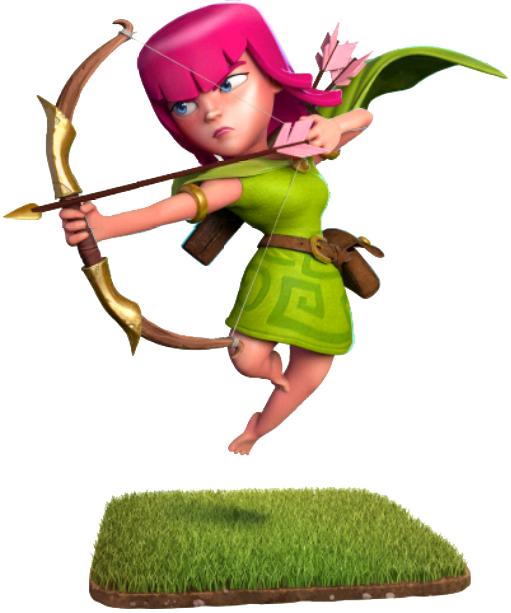 The Archer is one of many Regular Troops in the Clash of Clans game. These sharpshooters like to keep their distance on a battlefield and in life. Nothing makes them happier than single-mindedly taking down their target. The Archer is a female warrior with sharp eyes. She wears a short, light green dress, a hooded cape, a leather belt and an attached small pouch. She has a quiver slung to her back, a short bow in her left hand and a golden band on each of her upper arms. She is a ranged unit, the first such unit unlocked in the Barracks, and the second overall troop unlocked. Archers have no preferred target when attacking; they will simply attack the closest building to them. However, once they become aware of enemy Clan Castle troops, Heroes or Skeleton Trap skeletons (either by being attacked themselves or being near another friendly troop under attack), they will leave their previously targeted building and engage the enemy troops instead. Once all of the nearby enemy troops are defeated, they will proceed to attack the nearest building from their current location. Description of common tactics of usage an Archer on a battlefield is Here. Upon first receiving the Archer her hair is pink, and her quivered arrows are fletched with pink feathers. At level 3 & 4, the Archer’s hair turns purple and has a quiver full of flaming arrows. 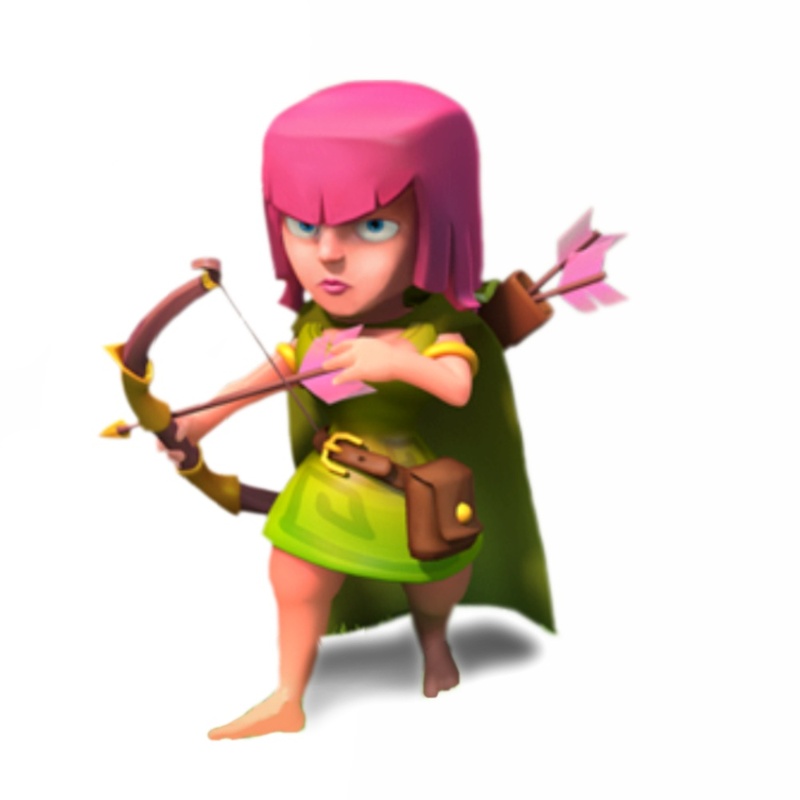 At level 5, the Archer’s hair turns back to pink, but she now wears her hood up. She has a quiver full of lightning arrows. At level 6, the Archer’s hair switches back purple that grows slightly longer. She gains a tiara and the arrows have purple fletchings. Her cape also turns from green to black. 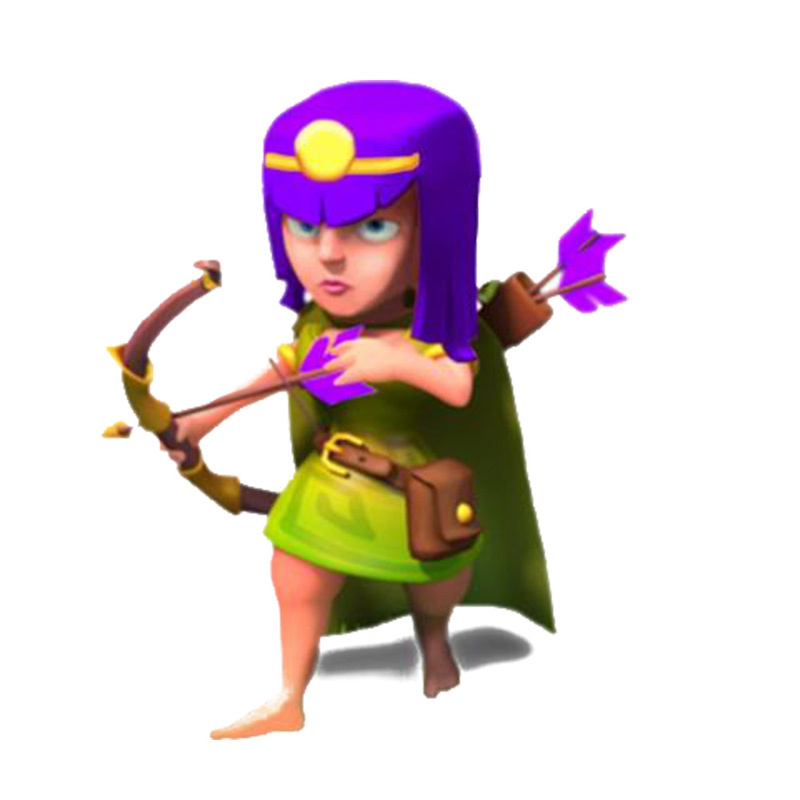 At level 7, the Archer gains a small purple crystal on her tiara, which she wears untucked. Her cape becomes lined with a gold fabric, and her quiver receives gold trim. Her arrows flame up whenever they are shot. It’s unknown why the Archer has a small pouch on her belt, though it’s likely to store supplies such as bow strings and water. Archers are generally recognized as the most popularly requested troops for the Clan Castle. When you tap on the Army Camp, all the archers stationed there pump their fists in the air three times. You can have a maximum of 240 Archers at one time in a complete set of fully upgraded Army Camps. This number increases to 275 if you include the 35 that can fit into a fully upgraded Clan Castle. On the battlefield, you can summon 12 additional Archers with a maximum-level Archer Queen. Since the July 1, 2015 Update, the arrow speed of the Archers and the Archer Towers has been increased. Archers can be destroyed in a single shot by a Mortar of the same level. Consequently, at Town Hall 9 and above (with a level 7 Mortar), even maximum-level Archers can be killed instantly by Mortar fire. She is the only ranged tier 1 unit, although the Minion can be used in a similar role. Unlocking the Archer in the Barracks earns you the first level of the Release the Beasts achievement. 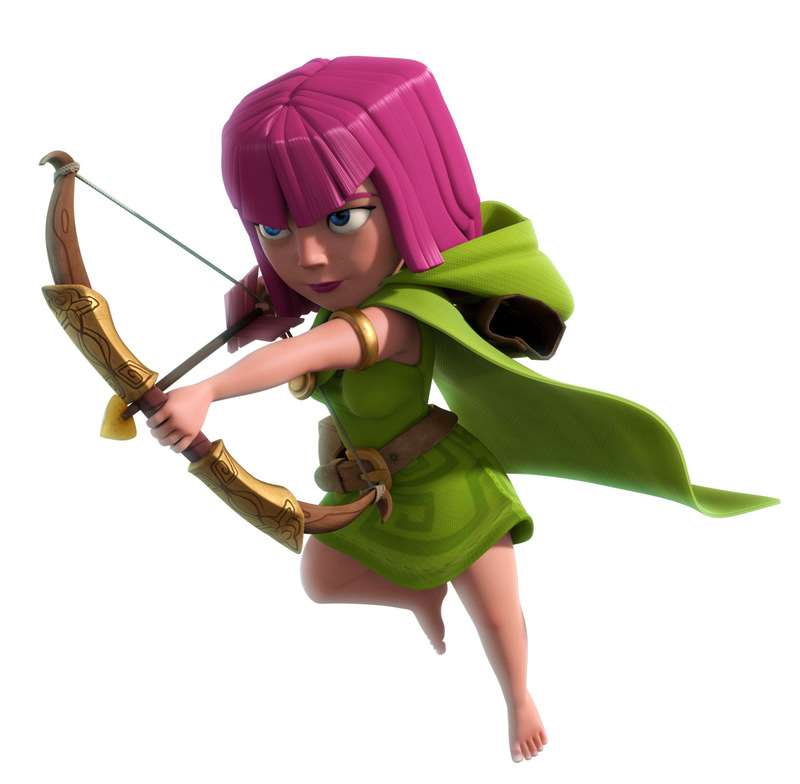 Archers, along with Barbarians and Giants, are currently the only three troops that can be upgraded to Level 7. 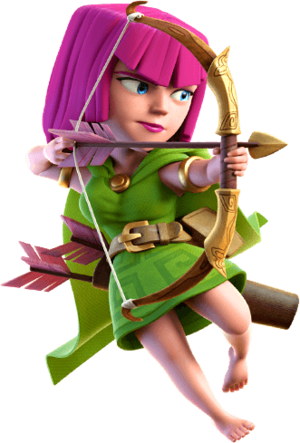 She is one of 6 female Troops, which includes the Archer Queen.